Question for Sikhs : Is Yogi Tea funding Un Sikh like practices in Yogi Bhajan's 3HO Kundalini Yoga cult? Yogi tea originated with a man named Yogi Bhajan who died in New Mexico in 2004. According to this article by cult expert Steven Hassan, Bhajan was born Harbhajan Singh Puri in 1929 and arrived in the U.S. with his wife Bibiji and three children in 1969 to begin teaching Kundalini and White Tantric yoga to the hippie counterculture of California and New Mexico. Soon after his arrival, he renamed himself Yogi Bhajan. Although he told everyone he was a well-known holy man in India, he had been nothing more than a customs inspector. “Members of Yogi Bhajan’s group claim to be Sikhs. However, according to mainstream members of the religion, by adhering to the doctrine of Yogi Bhajan, they are violating more traditional Sikh teachings. Yogi Bhajan’s teachings are closer to a synthesis of Kundalini yoga, tantric and New Age practices than anything originating from Sikh teachings,” Hassan writes. yogi teaSome of Bhajan’s more bizarre teachings include the claim that he could see auras around people as well as predict the future. After his classes, he would serve his pupils a spicy aromatic tea that came to be known as yogi tea. All Yogi Teas supposedly contains five basic spices – Cinnamon, Ginger, Cardamom, Black Pepper and Cloves – which supporters believe increase circulation, decrease joint stiffness, enhance digestion and decrease gas and nausea. According to court documents, as Bhajan’s community expanded and built ashrams throughout the U.S., yogi tea became part of his “brand”, as did some distinctly cult-like qualities. For instance, he encouraged members to support themselves by establishing businesses where they employed only members of his dharma. Among these businesses was the Golden Temple Conscious Cookery Restaurants which served – and eventually began to package and sell – yogi tea. In 1980, the Golden Temple Tea Company was formed by three of his followers and began doing business as the Yogi Tea Company by selling prepackaged Yogi Tea to Golden Temple restaurants and food stores. 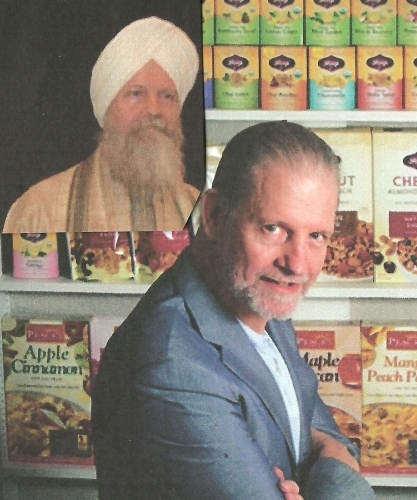 The company was eventually donated to Sikh Dharma International, a non-profit controlled by Yogi Bhajan. In 2009, sales of Yogi Tea exceeded $27million. Hassan claims that over the past thirty years, he has helped former members who allege sexual and psychological abuse by and under Yogi Bhajan. He is also aware of various criminal activities and Security Exchange Commission convictions of members of Bhajan’s inner circle. yogi tea 2“Several former students of Yogi Bhajan claim that when attempting to leave the group, they were threatened with violence. There is an unsolved murder of a member that is still under investigation, and also haunting suicides,” he writes. Yogi Bhajan’s widow Bibiji sued Yogi Tea in 2010 along with the State of Oregon, alleging that Yogi Bhajan’s advisers forged documents regarding their take-over of the company, excessive compensation and exclusion of the family from its board. This suit spurred numerous other suits which are still being litigated. Kaur wrote a well-researched article about these lawsuits which can be found here. I have never liked the idea of buying products from New Age companies and I certainly wouldn’t buy tea manufactured by a phony guru who ran a cult-like organization where he allegedly abused members. There’s plenty of great tasting tea out there. Take a stand against this kind of behavior and find another brand.